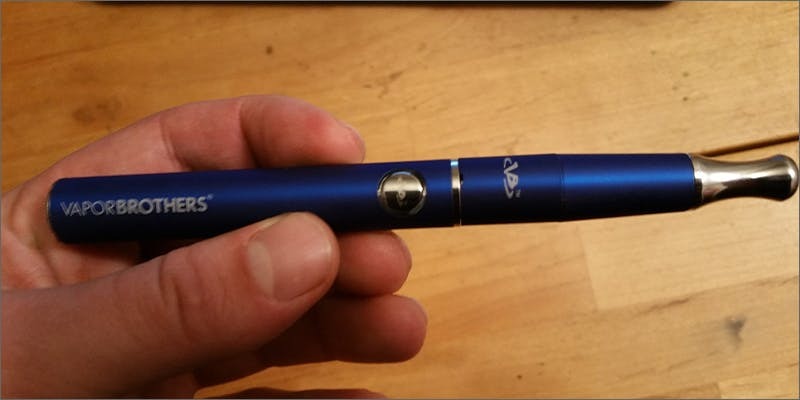 We checked out the Vaporbrothers VB11 wax/oil vape pen, and here’s what we thought. The VB11 utilizes the EVOD Battery that provides excellent battery life that will keep you vaping all day. Also, the VB11 has a carburetor that you cover with your finger allowing you to control the size of your vapor intake. You can purchase the VB11 directly from the Vaporbrothers website. The Vaporbrothers VB11 is exactly what you need if you are into vaping cannabis oils and wax. The VB11 combines a sleek aesthetic with dependable functionality that you can take with you anywhere. It comes in 3 different colors, Black, Fog, and Ocean. The VB11 is appropriately weighted, not too heavy, but also not so light that you feel like it will break. The vape pen is covered in a matte like texture that makes it easy to grip and distinguish from other pens or items that you may be carrying. Because the VB11 is available in 3 colors that blend nicely with its chrome mouthpiece we give it a 19/25 visual rating. The VB11 is professional looking and won’t attract a lot of attention from bystanders. The EVOD battery provides easy micro-USB charging that will last all day. There is also a power light indicator on the pen that will keep you informed of how much battery life you have left. The ceramic core skillet is durable and easy to access. The only downside to the core is that it must be replaced every few months. The core is deep enough to fit plenty of wax or oil, but its depth makes it a bit difficult to clean. The VB11 has an extra airflow hole on the cone that increases circulation, thus reducing heating time. The hole also allows you to control the size of your vapor intake. We give the pen a functionality rating of 21/25. The VB11 is excellently priced at $59.99. The high quality of the pen coupled with the comparably low price gives advanced vape users and beginners the chance to enjoy the product without breaking the bank. We give the VB11 a 20/25 for its price. Overall, the VB11 is just what you’ve been looking for in a wax/oil vape pen. It comes with a nice carrying case that you can zipper open and closed. The case has enough room to store your extra components like glass bulbs, the non-stick container, and cleaning supplies. The heating element is chromium free and does not use a wick, ensuring that your health is not at risk. The VB11 is an ideal alternative to complicated dab rig systems, especially if you are traveling often. We rate the VB11 at 20/25. The overall rating for the VB11 is an 80/100. If it was a bit easier to clean and if the skillet had a longer lifespan it would certainly command a higher rating. Give the Vaporbrothers VB11 a try for yourself and let us know what you think on social media or in the comments section below.